Nestled among the moss-laden oaks and tropical foliage of beautiful Winter Park is a Mediterranean-style building that turns heads. Step inside this James Gamble Rogers showplace, which is on the Historic Register of Winter Park Buildings, and you not only sense that you are a part of a unique tradition, but that this is a unique place for the nearly 500 people who share a common love of intellectual discovery, culture, fellowship, and social occasions. Scenic Winter Park is the home of the University Club. It is not affiliated with any college or university, and our members live throughout the central Florida area (fewer than half of our members actually live in Winter Park). They range from educators, physicians, lawyers, authors, and judges to journalists, nurses, business leaders, and entrepreneurs, to name just a few. Established in 1934 as a forum where people of diverse business, professional, socioeconomic, and academic backgrounds could meet and exchange information, ideas, and experiences, the Club cultivates a broad range of cultural, scientific, historic, and philanthropic interests through presentations, speakers, seminars, and group activities. Come visit us. Develop friendships. Worried about costs? Don’t be. There is a $25 initiation fee and an annual fee that is less than a dollar a day. Dinners and special events are priced below market rates. Check us out! We will welcome you with open arms and an open mind. 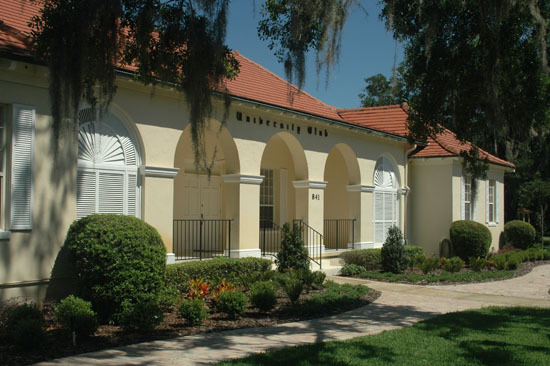 The University Club of Winter Park was established as an organization where educational and cultural activities could be pursued and where ideas would be explored and challenged. You can get a good idea of the scope of current activities by clicking on the tab to read this month’s Club Times. The Club was founded by retired college faculty members, clergymen, lawyers, physicians, and others of similar education and background, in order to hold regular meetings for discussion and fellowship. These founders wanted an organization different from many other university clubs. Business networking was not to be a component of the Club. Ideally, they wanted members to be on a first-name basis without the use of titles such as Doctor or General. They envisioned an egalitarian organization that would welcome people of all political and socioeconomic backgrounds.